When I get off planes in San Francisco and summon a Lyft or Uber, I usually have to wait 8 to 10 minutes. That's because the airport has forced these companies to force drivers to wait in the "cell phone waiting lot" which is quite far from the terminal. When I don't have checked bags, it's OK because I know this and I summon the car while walking out of the gate, but with bags I have to wait for my bag before I can summon. It's the same at many airports, for valid and nefarious reasons. At most airports you have to go upstairs. At some you have to walk a fair distance to the "rideshare" (I hate that term) pickup area, while taxis have a line right at the arrivals exit. At strange airports, I don't know what the wait time is so I can't summon until I find the pickup zone. Cell phone lots were built, as the name suggests, for people calling friends and family to pick them up. Because F&F are more tolerant of it, and they can wait at the curb for a minute or two, you can time your meeting for tolerable delays. Taxis can have a queue, with each passenger just being assigned the next cab in the queue. That doesn't work with Uber, where you need the next Uber, not the next car of any type. Because taxi rates are usually much higher than TNC, if you could get very quick service at the curb, few would take taxis from the airport. So they would fight a solution to this. Obviously the easiest solution is a waiting lot very close to arrivals. Many airports have this, in their short-term parking if nothing else. And some airports do just that. If there is not enough space, the airport could still allocate a smaller space, including using space from the existing taxi line. It does not have to be very large. Spaces in this final staging area could then be auctioned off to TNCs. The major companies (like Uber and Lyft) would win most of these auctions. 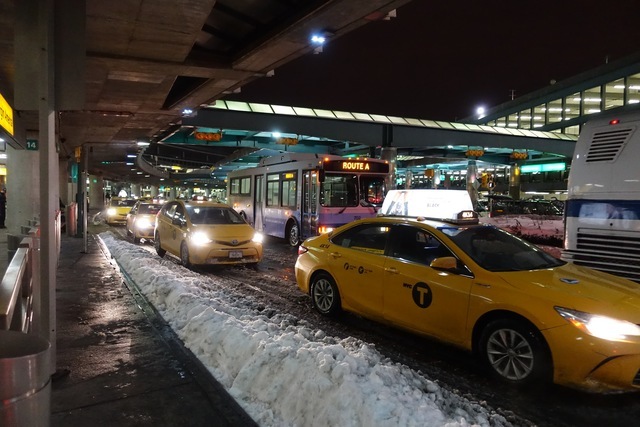 TNCs would take the spaces, and when a customer wanted a ride, they would allocate it to the next car in their staging area, ideally under a minute from arrivals. Immediately another car would start moving from a further staging area, or eventually from the far away "cell phone lot" or other lots if needed. In addition, if they exist, some of the spaces would be held back from the big companies for small companies. The small companies, however, would need to agree to work together. If a user uses the app of company A and one of their cars is there, great, but otherwise company A needs to do something to serve the customer quickly by working with the companies that do have a car there -- including the big ones that rented spaces. Like old taxis, there could just be a fixed maximum rate, and minimum quality at least for modest trips. Don't want to go for that rate, you don't get in the pool. Customers could be offered a lower rate if they are willing to wait. The company the customer used could pay their price, while they subcontract it out to another company possibly at a higher price. But next time, that company has to subcontract with the cheap company at the higher price until the balance settles. You would need to classify robotaxis from human driven TNC cars, since their price and service will be quite different. Over time, this lot should expand -- using TNCs is becoming one of the most popular ways to get to the airport. It's usually cheaper than driving there yourself and parking, so the decline in demand for parking should naturally open up staging spots.